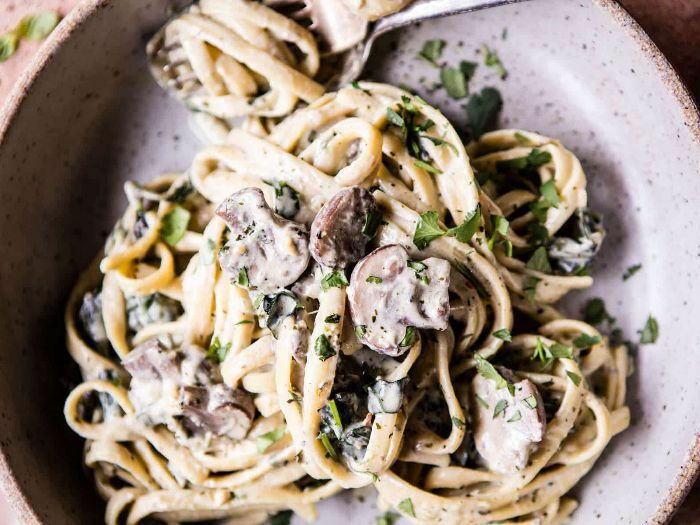 If you've been searching for the perfect wintertime pasta recipe, your search ends with Giada De Laurentiis's chicken tetrazzini. A classic dish made with sliced chicken, mushrooms, and a buttery cream and parmesan sauce, and topped with bread crumbs, cheese, and butter, this decadent meal will satiate your comfort food craving once and for all. What's more, De Laurentiis's variety is one of her top-rated recipes on the entire Food Network website, garnering 1189 five-star reviews from people who actually made the recipe. Spread one tablespoon of butter over a 13-by-9-by-2-inch baking dish. Melt one tablespoon each of butter and oil in a deep large nonstick frying pan over medium-high heat. Sprinkle the chicken with 1/2 teaspoon each of salt and pepper. Add the chicken to the hot pan and cook until pale golden and just cooked through, about four minutes per side. Transfer the chicken to a plate to cool slightly. Coarsely shred the chicken into bite-size pieces and put it into a large bowl. Meanwhile, add one tablespoon each of butter and oil to the same pan. Add the mushrooms and saute over medium-high heat until the liquid from the mushrooms evaporates and the mushrooms become pale golden, about 12 minutes. Add the onion, garlic, and thyme, and sauté until the onion is translucent, about eight minutes. Add the wine and simmer until it evaporates, about two minutes. Transfer the mushroom mixture to the bowl with the chicken. Melt three more tablespoons of butter in the same pan over medium-low heat. Add the flour and whisk for two minutes. Whisk in the milk, cream, broth, nutmeg, remaining 1 3/4 teaspoons salt and remaining 3/4 teaspoon pepper. Increase the heat to high. Cover and bring to a boil. Simmer uncovered until the sauce thickens slightly, whisking often, about 10 minutes. Bring a large pot of salted water to a boil. Add the linguine and cook until it is tender but still firm to the bite, stirring occasionally, about nine minutes. Drain. Add the linguine, sauce, peas, and parsley to the chicken mixture. Toss until the sauce coats the pasta and the mixture is well blended. Transfer the pasta mixture to the prepared baking dish. Stir the cheese and bread crumbs in a small bowl to blend. Sprinkle the cheese mixture over the pasta. Dot with the remaining three tablespoons of butter. Bake uncovered until golden brown on top and the sauce bubbles, about 25 minutes.